NEWS from mission fields across the world and recaps of the LWML Iowa East District and LWML Washington–Alaska District Conventions. Read the highlights here! 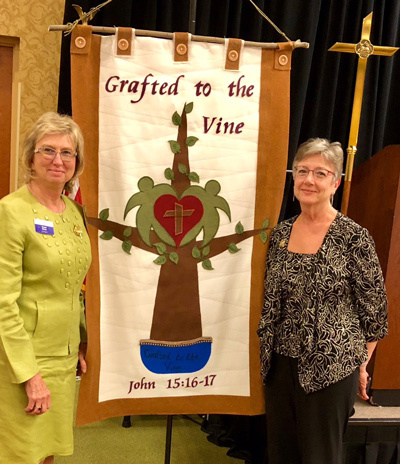 The LWML Iowa East District Convention was held June 15–16, 2018, in Cedar Rapids, Iowa. Jesus said in the theme verse from John 15:16–17, “You did not choose me, but I chose you and appointed you that you should go and bear fruit and that your fruit should abide, so that whatever you ask the Father in my name, he may give it to you. These things I command you, so that you will love one another,” cultivating the theme, “Grafted to the Vine.” LCMS Iowa East District President Rev. Dr. Brian Saunders served as Proclaimer. References to the vine were featured throughout the convention by keynote speaker and author Katie Schuermann, LCMS Director of Deaconess Ministry Deaconess Grace Rao, Rev. Dr. Brent Smith of Mission Central, and Gracie the LCC Comfort Dog with her handlers. 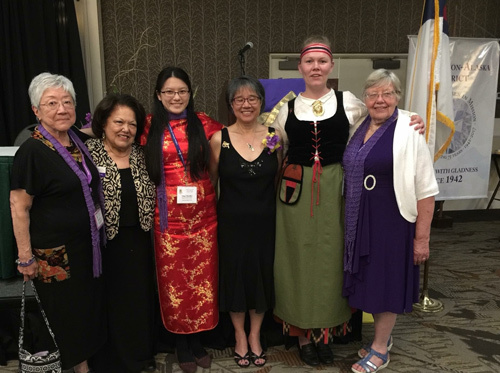 LWML members from the far-reaches of the Pacific Northwest gathered for their 31st Biennial Convention, June 15–17, 2018, in Spokane, Wash. led by LWML Washington-Alaska District President Marie Chow. “Rooted in Christ … Flourishing in the Faith” was the theme based on the following verses Therefore, as you received Christ Jesus the Lord, so walk in him, rooted and built up in him and established in the faith, just as you were taught, abounding in thanksgiving (Colossians 2:6–7). The convention goal statement was a reminder to all of the importance of our roots, “Rooted in Jesus my Lord and empowered by the Holy Spirit, my life, through faith, overflows with gratitude and service to Him”. A walk along the banks of the gently flowing Spokane River in downtown Spokane kindled enthusiasm for a “Walking Start” toward the LWML Washington-Alaska District mission goal. Serving as the Proclaimer during opening worship service, LCMS Northwest District President Rev. Dr. Paul Linnemann offered strengthening words. Bible study leader and keynote speaker Jan Struck continued to deepen the attendee’s roots through her words of encouragement and humor. Mites in Action speakers Laura Davis Director of Y4Life (youth and young adult program at Lutherans for Life), Anne Gonzalez Manager of Short-Term Service for the LCMS Office of International Mission, and Don Sundene Executive Director of Lutheran Ministry Services Northwest (LMSN), reiterated the importance of spreading the Gospel through our mites and missionaries. LWML Vice President of Gospel Outreach Angelina Jauregui and LWML representative to this convention commented that the delegates increased the mission goal an additional $5000 and that she was grateful to share in the awesomeness of God’s servants, rooted in Him. Marilee Ryan was elected as the new district president. Pictured (l-r): Rev. Dr. Douglas Rutt, LHM Executive Director of International Ministries; Lois Engfehr, LHM Grants Manager; LWML VP of Christian Life Jennifer Huecker; Kurt Buchholz, LHM President; and Eric Gates, LHM Regional Director for Africa and the Middle East. 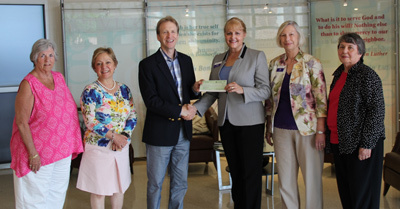 Lutheran Hour Ministries (LHM) was honored to receive a $100,000 grant from the Lutheran Women’s Missionary League in support of its mission outreach efforts in the Middle East and North Africa. 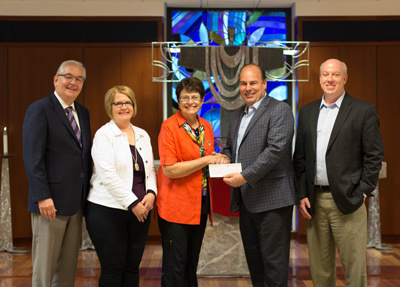 LWML Vice President of Christian Life Jennifer Huecker presented the grant check to LHM President & CEO Kurt Buchholz during LHM’s weekly staff chapel service on May 24, 2018. The grant, “Christian Hope through Mass Media in Egypt,” was approved during last summer’s LWML Convention and helps LHM reach people in Egypt and more than 20 countries across the region through a new variety television program developed in partnership with SAT-7 as well as continued holistic, refugee-relief efforts. Kurt Buchholz thanked LWML for their partnership in the Gospel, as this will have a great impact on the people of the Middle East and North Africa in sharing the love of Jesus Christ. At the check presentation on June 6, 2018 at the LWR Headquarters in Baltimore, Md. are pictured (l-r) quilter Gail Kolos, St. Paul Lutheran, Annapolis; Geri Sicola, Vice President, Strategic Partnerships and External Relations; Daniel Speckhard, President and CEO; LWML Meeting Manager Leslie Jaseph; Edi Collis, LWML DP Chesapeake District; and quilter Carol Petzold, Lutheran Church of St. Andrews, Silver Spring. Every year, many LWML groups and individuals join their hearts and hands in sewing mission quilts, making blankets, and assembling personal care, baby care, school, and fabric kits to be distributed to people in need through Lutheran World Relief (LWR). Delivering these materials to people in need is a long and sometimes complex process, involving trucking and rail transportation, warehousing, processing, and overseas shipping. This grant ensures the ability to deliver more than 35,500 quilts each year to our neighbors in need around the world and sustains the ministry that so many LWML’s have been a part of for generations. Three women from the Lamjung district who survived the spring April 2015 earthquakes in Nepal hold LWR quilts for their families to help them through the cold nights in temporary shelters. 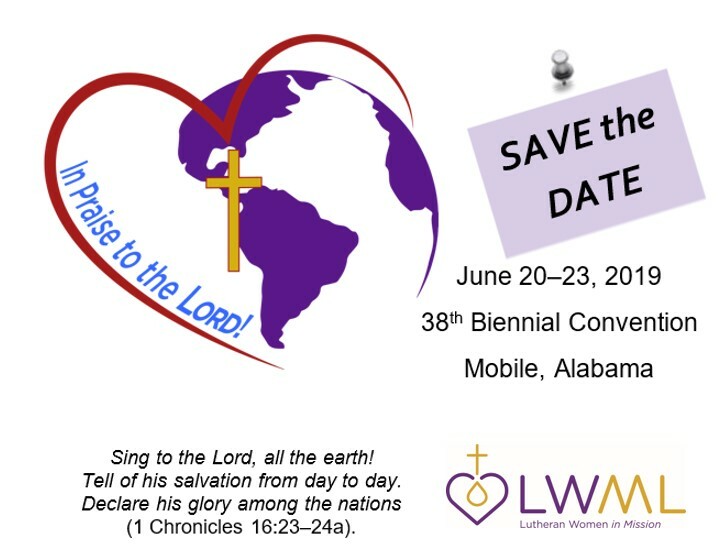 The 2017–2019 LWML Nominating Committee is in the search process for nominees in the following positions to be considered for election at the 2019 LWML Convention in Mobile, Alabama. Prayerfully and diligently seek out women for these positions. Any member of LWML may suggest names for these offices, but the forms must go through your LWML District President for her signature. The deadline for submitting forms is August 15, 2018.